Temperate rainforest soil is rich in nutrients. The rich dark damp soil along with the plentiful rainfall found in this biome promotes the growth of a variety of plants including the tallest trees in the world. On this page you will find facts and information on why this soil is so rich in nutrients, what the difference between the soil found in temperate rainforests and tropical rainforest is, along with other interesting facts. An interesting fact is that the soil in temperate rainforest biomes is actually richer than the soil in tropical rainforests. This is the opposite of what most people would expect. You would think that the soil of tropical rainforest must be rich due to the abundant vegetation that grows in these regions. Many of the early European settlers of tropical regions also believed that the soil must be rich. They cleared large areas of the tropical rainforest and planted crops only to find that after one or two growing seasons the soil was depleted of nutrients resulting in poor crops. The poor soil quality is due to the rapid nutrient cycling in the tropical rainforest. When organic material decays the nutrients are recycled very quickly by the living vegetation, including the tropical trees with their shallow roots. This allows very little nutrients to reach and stay in the soil. Temperate rainforest biomes do not have rapid nutrient cycling. 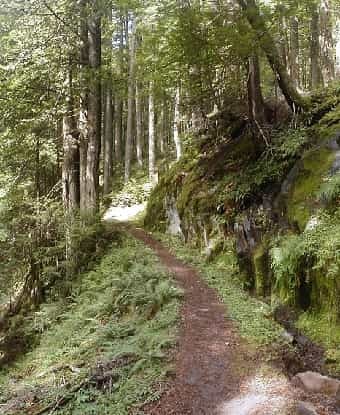 There is less biodiversity in temperate zones and the plants there do not immediately strip the soil of nutrients from the decaying matter on the forest floor. Also, the cooler temperatures of the temperate forests as compared to the tropical forests help slow the speed at which organic material decays and is recycled. Decomposers are necessary in order for the temperate rainforest soil to benefit from the astonishing amount of organic material decaying on the forest floor. Decomposers break down dead organisms (plants and animals) and use them as a food source in a process called decomposition. This process results in nutrients from the decaying organism being returned to the dirt. Some decomposers include insects, bacteria, and fungi. Fungi is an extremely important decomposer because it is the only organisms that can break down the cellulose found in plants; allowing the cellulose to return to the soil. Cellulose is a complex carbohydrate that makes up a large part of the cell wall in most plants. If it were not for fungi leaves and tree limbs would not decompose and therefore their nutrients would not return into the soil.